WSLH AR Laboratory Network Coordinator Ann Valley reads antibiotic susceptibility plates. Between January – September 2018, scientists in the Wisconsin State Laboratory of Hygiene (WSLH) Communicable Disease Division identified nearly 300 CRE (aka “nightmare bacteria”) isolates with antibiotic resistance genes that were new or uncommon for our area. That’s just one of the data points from the Centers for Disease Control and Prevention’s (CDC) recently released 2018 AR Investment Map. 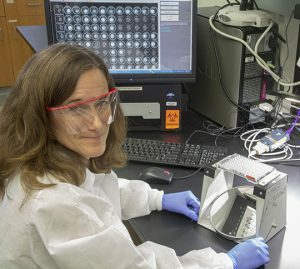 In fiscal year 2018, Wisconsin received more than $3.2 million from the CDC to combat AR threats, including funding for the WSLH to be 1 of 7 AR Laboratory Network regional labs.